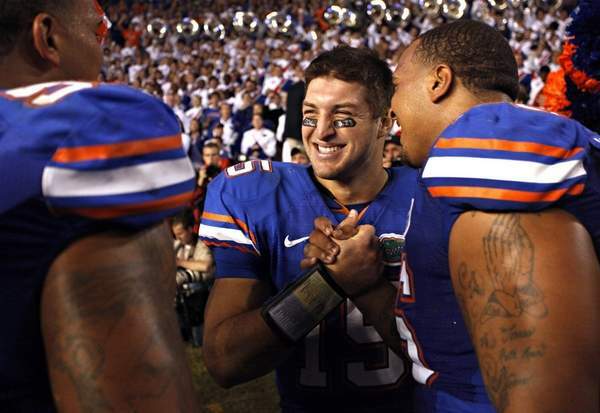 The Gator-Seminole game a week from tomorrow will be Tim Tebow's last home game. My friend Sam, a Gator who recently retired to Gainesville, tells me that a wave of appreciation is sweeping the entire town, with advertisements being taken in newspapers and posted on billboards expressing thanks for this young man. Sam said that Tebow has had an "unbelievable impact" on the Gator Nation "just doing the right thing." Sam describes him as the "un-all about me" football hero. 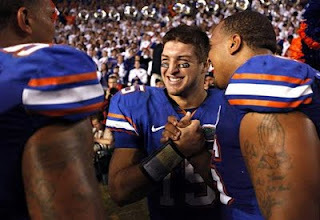 He also said that Gator fans next weekend will all be sporting the "eye-black" patches at the game in honor of Tebow. I hope we'll get to see a Gator/Longhorn Championship game!